A number of people asked me for the recipe. 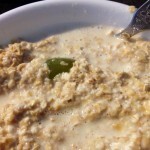 It appears that oats aren’t so popular here in India, largely because they were commonly served as a sticky, often tasteless porridge, so people were intrigued by the idea of an appetising, tasty oats dish. Happiness Oats™ is very simple to make, even if you are all thumbs in the kitchen. There is no cooking involved, and it takes 2 minutes to make them. In a 1-person bowl (the same one you will serve the dish in – if for more people, use separate bowls, multiply ingredients accordingly), chop the banana into slices. Throw in the other fruit, half-filling the bowl. 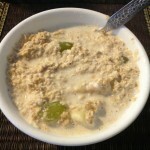 Fill the rest of the bowl with oats, covering the fruit. 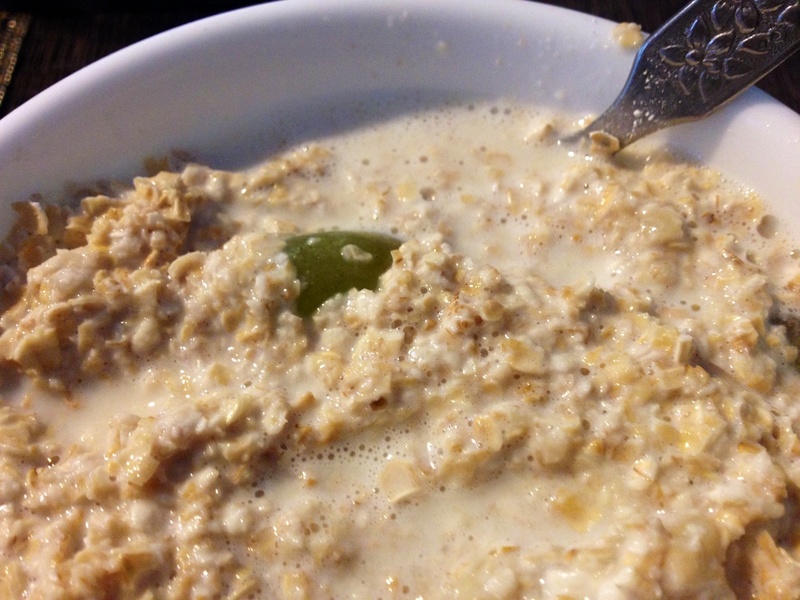 Pour in the milk – just enough that the oats begin to float. Don’t put in too much, or it becomes difficult to eat. With a spoon, fold (mix) the entire contents of the bowl so that the fruit are evenly distributed. Add sugar or honey (or sweetener) to taste. 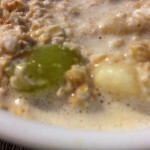 Allow the mixture to stand for a minute or two to allow the oats to soak up the milk. The result should be fairly thick, but creamy (no lumps) mixture that is easy to spoon up and eat. 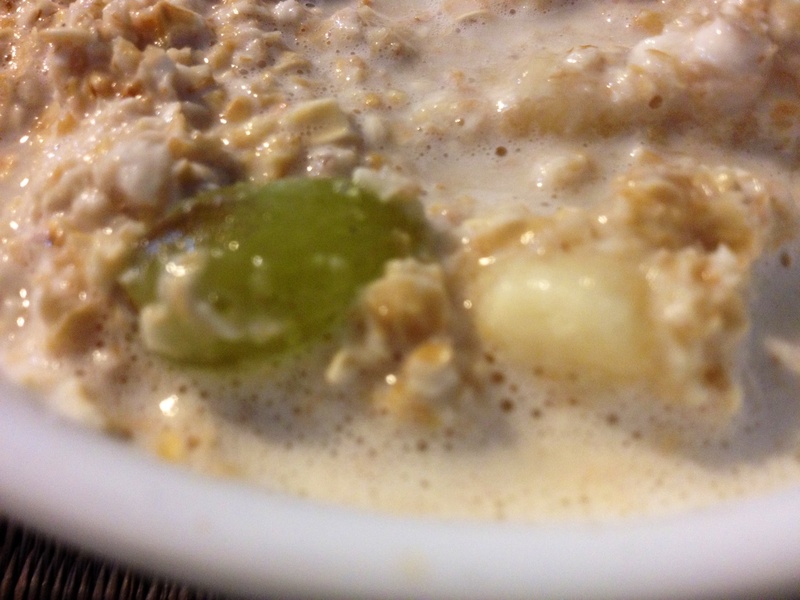 If necessary, add more milk and mix again with a spoon. The banana isn’t just a fruit ingredient of the dish, but part of the base of it. It gives it that chunky goodness, and is of course very healthy. Some people may say “I don’t like banana” but give it a shot – it makes all the difference. Avoid using citrus fruit for the obvious reason: they will cause the milk to split/curdle. Make sure that the secondary fruit are seedless or deseeded. If using “hard” fruit (like apples) chop into smaller pieces for easier eating. Some fruit are very sweet on their own (e.g. Chikoo), in which case reduce sugar. Too sweet is as bad as unsweetened. Taste the dish before adding sugar/honey/sweetener. I have found warm milk to be more enjoyable with this dish than cold milk, but that’s probably just me. That’s it! 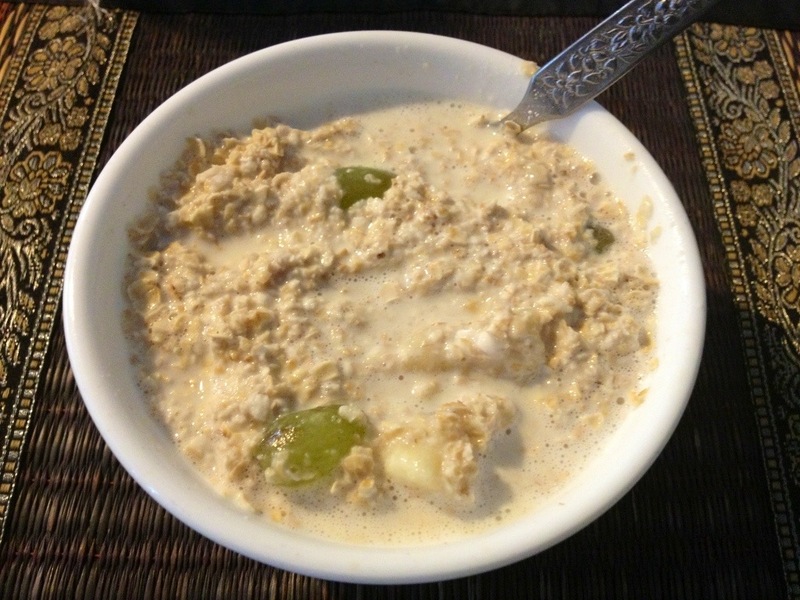 Enjoy you healthy, filling, power-packed and extremely tasty Happiness Oats™! And remember: breakfast is the most important meal of the day. Make it count!